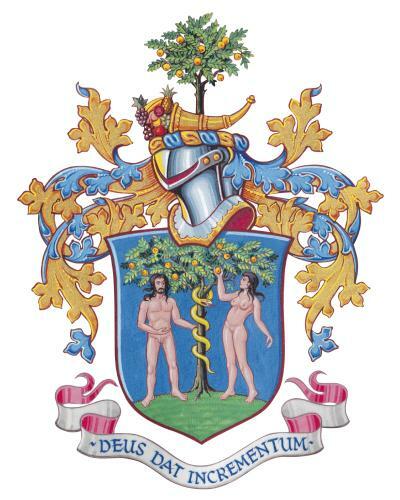 The Worshipful Company of Fruiterers has been in existence since before 1300 AD and stands 45th in order of precedence of the Livery Companies. Over the 700 years of our history, the Worshipful Company of Fruiterers has assumed a number of different roles. In its earliest days, it was a classical medieval guild governing the fruit trade, maintaining quality, training apprentices, caring for its members and doing other charitable works. By late Victorian times, in common with most Livery Companies at that time, its connections with the trade all but disappeared, but the Company’s function as a City of London institution continued to flourish. During the 20th century, the Fruiterers returned to the Company and more than half of the current membership is engaged directly with the fruit industry. Throughout our history, friendship and hospitality have been the golden thread that has guided the Company through its many changes. A history of the Company was written by A.W Gould and published in 1912. Azure on a mount base vert the tree of paradise environed with the serpent between Adam and Eve all proper. The Company has used these arms since 1476. They were re-confirmed by Letters Patent from the College of Arms in 1979. John Quiller Rowett LLD, Master Fruiterer 1921, made a fortune in the spirits business. He had a desire to do more than make money. A school friend of Sir Ernest Shackleton at Dulwich College, Rowett was the financial backer of Shackleton’s final Antarctic venture.